The Jouf was designed by Bob Terzuola, the godfather of tactical knives, and produced by FOX Knives out of Maniago, Italy. "Produced in Maniago, Italy" is the theme of the entire enterprise for MKM, which is aptly named. This 'brand' is a collection of four of the top knife manufacturers in Italy working together to consolidate and strengthen their commercial contributions to foreign markets. The Jouf is a purpose-built combat knife designed with ultimate functionality in mind. It's large enough to handle all the necessary cutting tasks while remaining compact enough to have with you at all times. The heart of this knife is the full tang Bohler N690Co stainless steel blade available with either a stonewashed or black Cerakote finish. 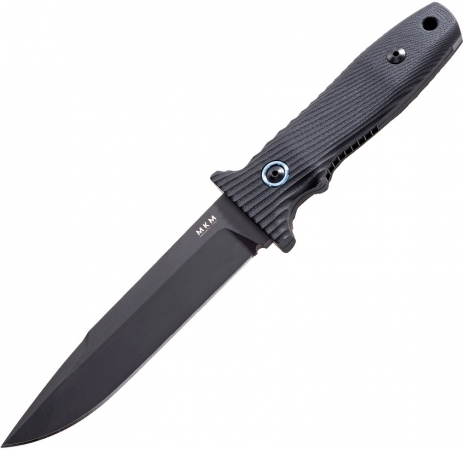 The removable handles are 3D machined black G10 with a double guard and lanyard hole built in. Each knife ships with a MOLLE compatible black Cordura sheath, ready to be pressed into battle against man or mother nature alike.